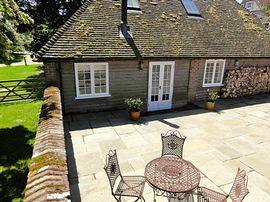 Located in the South Downs National Park, yet only 10 minutes from the centre of Chichester,Chauffeur's Cottage is newly refurbished and luxuriously appointed. 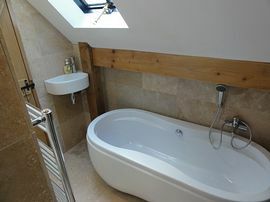 Downstairs comprises of a cloakroom, spacious open plan sitting and dining room with log burning stove and French doors open out on to a private terrace. There is a fully fitted, well equipped kitchen with granite work surfaces. 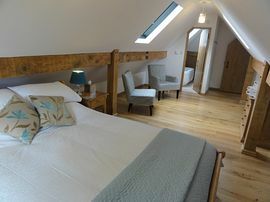 Upstairs there are two large double bedrooms, both with en suite bathrooms. 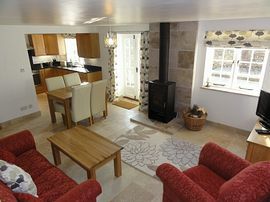 The cottage is underfloor heated throughout, travertine stone floor downstairs and oak floor upstairs. There is WiFi throughout. Satellite television, DVD player and ipod docking station. Access to the Farmhouse large indoor swimming pool and gym is available by prior arrangement (there is a small service charge for this facility). 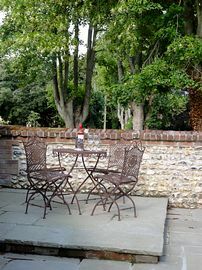 Although the cottage is self catered, a substantial welcome breakfast pack is presented for your first morning. Leave Chichester on the A286 (direction Midhurst), just after Lavant turn left on to the B2141 (direction Chilgrove, Harting, Petersfield), take the first turn on the left- there is a small lay by with a red letter box. Proceed up the gravelled drive. At the end is a post on the right hand side, the top button opens the gate and Chauffeur's cottage is on your right.